Street food equipment There are 75 products. • perfect for the storage of sprinkles, nuts, candies and decorations • ingedients are highly visible and hygienically protected • stainless steel casing • 5 plastic containers • with transparent lid Price without VAT. 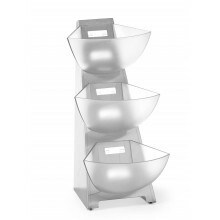 Material: stainless steel• Ergonomic handle• Shut-off valve• 3 nozzles: Ø 4, 5 and 6 mm• For dosing sauces, dough etc. or decorating Price without VAT. 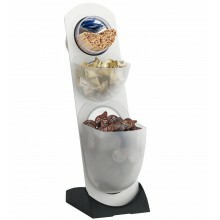 • for Twist Pop waffle on a Stick • stainless steel Price without VAT. 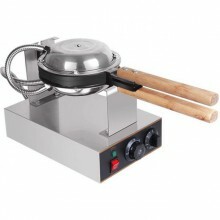 • for Butterfly Waffles on a Stick • stainless steel• with 11 holes Price without VAT. • for Lolly Waffles on a Stick • for cotton candy • stainless steel• with 8 holes Price without VAT.